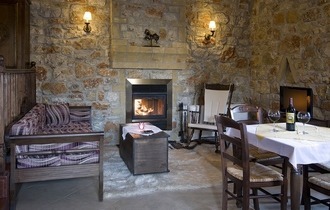 Each time you make a reservation through this website, your reservation is made directly with Klymeni Traditional Homes. As such, you are guaranteed the lowest possible rate, unlike reservations made through third party systems (whose prices include the given platform’s commission). To view rates, availability and make an online reservation directly with Klymeni Traditional Homes click here! 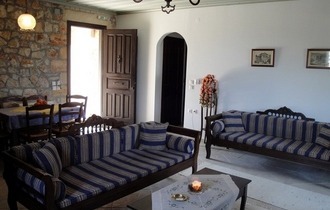 "Klymeni Traditional Homes" is found in Nafplion, at an exceptional location. It is built with respect for the environment, at the foot of Palamidi Fortress, in 8 acres of olive trees, orange trees, gardens, natural springs and a private Byzantine chapel. It has a marvelous panoramic view of Palamidi, Nafplio, the Argolic plain and the Argolic Bay. It is 1 ½km from the old town of Nafplio and consists of independent, luxurious stone-built homes and apartments that can accommodate 1 to 6 people accordingly. Each home is decorated in a "different" style and is fully equipped with all modern amenities. They offer a kitchen with all the necessities, traditional hand-made furniture with white marble, living room with fireplace, air-conditioning, central heating, bathroom with "hydro-massage", and balcony with a marvelous view. Pets are also accepted upon request.